Are You Living Abroad in Germany or Planning to Move to Germany in the next 6 to 12 Months? Beware!!! Munich Business Customs and Traditions Could Turn Your Once in a Lifetime Experience into a Nightmare. Congratulations on having the courage to take such a big step! You're excited, the family's excited, your friends are jealous and you already have a job offer. You never ever expected to have such a huge opportunity. But, guess what? You have the opportunity and it's awesome! You're going to live in Germany. YEAH!!! Not so fast… You're about to get a FRIGHTENING WAKE UP CALL! No. Not because you're throwing caution to the wind and pursuing a new life in Europe. That's awesome! You'll be the envy of all your friends. You'll have experiences that you will cherish for the rest of your life. You'll finally have something interesting to post to your Facebook wall. Culturally, your children will be ahead of all your friends' children. From whatever angle you look at it, you're in a great place in your life right now. But, if you're not well-informed, you're in for a SHOCK! If you have already made the move and are currently living in Germany, you've already been slapped in the face with this reality. There is one MAJOR obstacle that you might not even be aware of. Foreign visitor after foreign visitor have made these same mistakes. They've underestimated the necessity to prepare for the rental market in Munich. Many Americans (and other nationals) before you have horror stories to tell about housing in the Bavarian capital city of Munich. Many of them find themselves still living out of a hotel six months down the line. Can you afford to spend thousands of dollars on hotel fees? Do you enjoy living out of a suitcase for a seemingly endless period of time? Over the next year, can you afford to pay the hotel rates you are currently paying as well as put enough aside to pay move-in costs when you do find a permanent apartment? Are you already desperate and ready to give up on that dream apartment of yours you're so eager to move into? Many foreigners have to move back to their home country before they're ready to return because they've run out of money… because they are eating out every night without a kitchen to cook a meal in and save on food. No one told them about the challenges of finding an apartment in Germany. Munich is not like Denver, New York, Los Angeles or any other American city when it comes to finding and leasing an apartment. In America, apartment hunting is pretty much the same no matter what state you move to. In European cities, such as Munich, expectations and protocol for finding an apartment to rent are worlds apart from those in America. For example, did you know that you will pay twice the commission for hiring a real estate agent even though you only get the services comparable to one agent? Don't sell your home or sublet your apartment in your home country prematurely. You need to read this first. 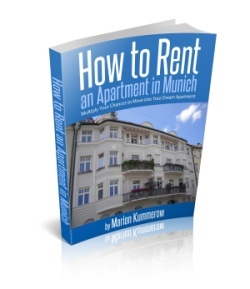 This ebook is an invaluable guide for foreigners to raise their chances and find their dream home in Munich. Marion takes prospective tenants step-by-step through the process, talks about the obstacles and legal stuff, and explains how the real estate market works in Germany. How to rent an Apartment in Munich gives the plain facts that are important to know for everyone who wants to succeed in renting a home in Munich. If you have unlimited financial resources, pay no attention to this page. Click away right now, if you are willing to pay any price necessary to secure your German dream apartment. If you can afford to pay the rates of your extended-stay hotel, by all means stay there and enjoy Munich. But, if you're like the rest of us who can't afford to make reckless financial decisions that could lead to huge disasters… (not to mention, huge disasters in a country unfamiliar to you…) then take the next three to four minutes to read this letter in its entirety. Sure, you can review some apartment listings online. Sure, international calling rates are a fraction of what they used to be. Sure technology makes it easier to transition to another country… But before you pack everything and book your flight, I'd like you to consider a few things. Do you have the contact information for the best real estate agents in Munich? How much money have you set aside to cover the hefty fees that you will encounter by using a real estate agent? Are you even familiar with the additional expenses expected to pay in order to move into a Munich apartment? Do you have sufficient connections in Germany so that you can avoid the expense of hiring a real estate agent? How fluent are you with German legal terms? Do you know what a mietvertrag is? If you answered no to any of the questions I've just asked, then I have created this page and the resource you are about to discover specifically for you. It's not uncommon for foreigners to get a job offer in Germany and find that months after they've moved that they are still living in a hotel. Those with corporate budgets to cover their expenses don't complain as much. The extended-stay hotels are great if someone else is footing the hefty bill and you don't have a family bigger than you and your spouse. That's why my team and I created this unparalleled resource. With this powerful resource at your fingertips, you will avoid making the same mistakes most foreigners make when moving to Munich to pursue a different career, study their family heritage or who have just fallen in love with Germany. How helpful could detailed step-by-step instructions be for your move to Germany? How helpful could a glossary of German words be to help you communicate with lessors? If all you know about Germany is Oktoberfest, then you are in for a treat. It's no wonder Munich, Germany is such a competitive marketplace for rental properties. You'll find everything from stunning attractions, world-class museums, delicious Bavarian food, to throbbing nightlife, and beer gardens. I, myself, never want to leave Munich. The time arose when my family needed to move into a bigger property. That's when I was thrust into the chaos of Munich's rental market. My family and I were planning a move to a bigger house and we needed to rent out the apartment that we had moved from. I was shocked (pleasantly) to discover that I was in the driver's seat as the landlady. 24 hours after posting my listing online, my two bedroom flat had raked in 35 inquiries. I had to remove the ad so that I could catch up with all the calls and emails that I was receiving. I had planned to re-post it once I had gone through the initial inquiries. But after 23 visits in one week, there was no need to re-post the listing. I had my pick of the litter of who I wanted to rent my flat to. The Landlord is in the driving seat. Foreigners have no idea how competitive apartment searches in Munich can be. In Munich, the landlady makes the rules. There are far more people who want to live in beautiful apartments in the center of the capital, but there aren't nearly as many properties available to accommodate the demand. Before you can get a Mietvertrag (rental agreement) that secures your dream apartment, the landlord has to find favor in you over potentially a hundred other applicants. The best properties can be snatched up before you can even call to inquire about it. How do you compete to find the best apartment for your family's needs when the competition is so fierce? It's especially hard for foreigners for several reasons. For Americans in particular, the reality of the apartment search atmosphere in Germany may be a hard pill to swallow. Even if you took a course on basic German language, you're still going to have a problem with the more technical terms. However, your fluency in the language isn't going to make up for the fact that you most likely won't have any German references. Your native counterparts will have one leg up on you already in a marketplace where you're already at a disadvantage. You can't change your ethnicity, but it could work against you if you don't know how to offset the perceptions that the landlord may have about people from your same background. Off course there are laws to safeguard you from this kind of discrimination. But the truth is that it still happens everywhere. How do you know whether the landlord has negative preconceived notions about your ethnicity and how do you overcome that? It may sound different than you're used to, but the landlord has to like you more than the other applicants before you can get the apartment. Your credit worthiness is not enough to secure the apartment for you. Usually if you want to rent an apartment you can either ask a real estate agent to help avoid these pitfalls. The problem in that is that German real estate agents can be very expensive. Important Note: The natural tendency for new residents is to look for a real estate agent to help with the transition into the new city. The belief is that the real estate agent knows the terrain more than the new resident. In Munich, there is more to hiring a real estate agent. The real estate agents always work for the landlord and will be virtually useless in protecting your interests, plus you'll incur twice the fees. If for no other reason, you must access this guide by clicking the link on the bottom of the page, so you can understand the phenomenon of working with a real estate agent in Germany. Learn the system so the system doesn't take advantage of you. The other way new arrivals avoid the pitfalls or costs associated with real estate agents is by relying on connections. If you're willing and able to pay any price, you can easily have your dream apartment without worrying about the competition. If you don't have unlimited financial resources, a real estate agent in Germany that you can trust, or connections that you can rely on click the link at the bottom of this page and you can also avoid the pitfalls that most foreigners consider the worst learning curve EVER. This comprehensive guide, How to Rent an Apartment in Munich: Multiply Your Chances to Move into Your Dream Apartment, will put you at the top of the application pile. With this powerful resource at your fingertips, you will avoid making the same mistakes most foreigners make when moving to Germany to pursue a different career, study their family history or who have just fallen in love with Germany. Moving is always an expense. Have you set aside enough money to cover your move-in costs? Do you know what terms to look for in a listing so that you won't be in for a big surprise when you visit the property? For example, you sign a deal without reviewing the property because you didn't want to lose the property to another renter. When you get there, you have no kitchen appliances such as a refrigerator or stove. The landlord points to the listing when you complain and says that it didn't say anything about Einbauküche (fitted kitchen). Every valuable tidbit you get from How to Rent an Apartment in Munich: Multiply Your Chances to Move into Your Dream Apartment will save you time, money and headache. Should you put your energy into this listing or that listing? Getting the information you need is easy and will make your apartment hunting that much easier. Consider this your tour guide to better, more efficient apartment hunting instead of a tour guide that just shows you the attractions. With the assistance of this powerful resource, you will have more time to explore and enjoy the local attractions. ORDER TODAY and you'll also receive the following 2 FREE bonuses worth AT LEAST €10.00! With your one-time, small investment into your new European experience, you will also get the German glossary to help you overcome any language barriers. In Munich's rental market it's almost obligatory to fill in a so-called Selbstauskunft with your financial information in an easy-to-read form to help real estate agents and landlords quickly review your file and put your application at the top of the list. This form would would normally cost you as much as 4 Euros and can usually be used only once. I considered teaching this information in a class for new arrivals in which I charged each student 199€ for this information. There was a lot of interest. By the urging of friends and colleagues (even German natives are eager to get my information into their hands! ), I considered packaging this information into a webinar to expand my reach to people who hadn't yet arrived in Germany for 89.95€. But I wanted to make this affordable to anyone. I set out to help people, not take advantage of foreigners who are already unfamiliar with the territory and already a target if they are uninformed. I decided to package this information into an eBook and drop the price dramatically to make sure this information is accessible to everyone who needs it. For only 19.95€, 14.95€ this guide will give you the low-down on Munich's competitive apartment market and how to be one of the first to get a call back from the landlord. Buy following these simple steps you can avoid all the mistakes foreigners usually make when they move to a European country. For only 14.95€, you could save yourself 6,000€ in hotel costs, additional fees, realtor commissions, etc. Simply click on the link below to download this essential guide risk-free. Go ahead and download this important digital resource. There is no risk. Within the next 180 Days if you haven't secured the apartment of your dreams, then I'm willing to refund your money. I repeat. If you don't secure a Munich apartment in the next 180 days, you can email me for a FULL NO QUESTIONS ASKED, REFUND of your course price. This powerful guide will be the smallest investment you make into your European experience, yet have the BIGGEST impact on your new life in Germany. It's not just an eBook. It's not just generic information you will read once and put aside. You will refer back to this guide from time to time to make sure you're on the right track. Plus, there are the amazing bonuses you will get with just one 10 second download. A Glossary of German terms to assist you with understanding the local real estate terminology. I know what it's like to transition to a new country. I see it all the time in the properties that I rent to people. Moving can be stressful. My goal is to help families make that transition with as little stress as possible. Plus, I want you to see that Oktoberfest is really a cultural festival and it's much more than an infamous beer festival. I want to share the beauty of Munich and its rich historical culture with as many people as I can. Allow me to help you to enjoy this extraordinary city. If you don't order now and you navigate away from this page, I can guarantee that you will have your own German apartment hunting horror stories. I know you're smarter than to let this opportunity slip away. Your family means to much to you and this little financial investment is nothing in comparison to avoiding any disruption stress can add to a family in transition. P.S. See you at Oktoberfest so that you can thank me in person for making your move much more smooth.